for the uninitiated- the Pokémon world is called Kanto, and the world in Gold/ Silver would be called Johto. That’s a pro tip for free. And yes, my player character’s name was “Phantom”. In a post yesterday, I explained that I recently dug up an old notebook full of musings from the past. A lot of it is video game related- cheat codes, lists ranking characters that I thought were cool, that kind of thing. I felt like one bit in particular deserved it’s own special treatment. As a kid in the late nineties, I was obsessed with Pokémon. I remember reading about how the series was taking over Japan in Nintendo Power, and not really understanding it until I saw it for myself. 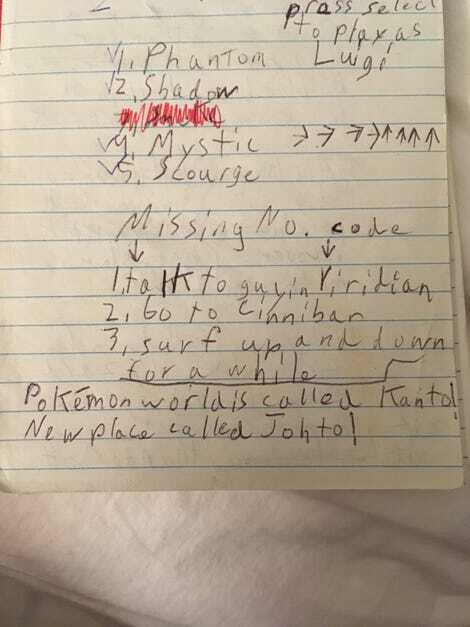 Christmas 1998 I received a Game Boy Color (berry colored, of course; I was such an iconoclast) and two games: Toy Story 2 and Pokémon Blue. I think you can guess which one I played all day while sitting on the floor of my uncle John’s house while everyone else socialized. I was consumed by the game. All of my friends had either Red or Blue version and we would use our link cables to trade, battle, the whole shebang. There was really nothing like it at the time and there hasn’t been anything like it since. We were all the perfect age to play and suspend disbelief and our parents didn’t really have any idea of how much sleepover time was spent playing our gameboys in whatever spot of moonlight we could sit in. All that to say- we all had our teams. We all had special nicknames for our Pokémon that no one else was allowed to use. We all agreed to “trade and trade back” to get Alakazams and Gengars and whatever else. Some of us used the Cinnebar Island MissinNo. Code to experiment with items and glitches (my friend Brad was always fond of his level 256 Golduck) but I was more of a straght-and-narrow kind of player. You grind your team by beating the Elite Four as many times as you can before bedtime, damn it! That’s how we did it back in the day, and that’s how it should be done now. I’m straying from the point. After a while I found a team that I loved, and went out of my way to make it the best it could be. Now, “the best it could be” two decades ago was very different than today. I’m sure that the numbers-obsessed training that dominates the scene today probably still existed in some form back then, but my friends and I didn’t care about that. It’s honestly the reason I can’t play Pokémon games to this day. I love the quality of life improvements that have been layered into the series but I hate the competitive scene that’s focused on min-maxing and specific counters and tiers. Not to yell at clouds, I’m glad that people have devoted the time to eking out the most from their favorite franchise, but it isn’t for me. An old friend got into EV and IV training around Diamond/ Pearl era and while I picked up Platinum in an attempt to get back into the franchise, I could never keep up with his perfectly trained teams and I never even attempted to link up with anyone online. I think when people my age complain about the series having jumped the shark after the first two generations what they’re really mourning is how much the series has evolved competitively. It feels to me like later games emphasized the multiplayer aspect- it was always in focus in Red/ Blue, but it’s eclipsed by what’s on the table now. I think I’m going to pick up Heartgold or Soulsilver one of these days, maybe get a device for my fiancée to play on and maybe we can rekindle the old magic. Without any more preamble- one of my teams from back in the day. Please ignore the serial killer handwriting. And note the page title: The GBC Pages. For posterity. Looking at it now, of course it’s terrible. Why would I give Blastoise two water-type attacks? Same with Flareon, Hitmonlee and Zapdos. Why use just one legendary bird when there were three available? Or just dig up Mewtwo? Why isn’t a Dragonite anywhere to be found? Why the hell does my Alakazam have Dig? The inclusion of Metronome on two separate Pokémon is insane- I definitely lost battles to my friend Nicholas because of a Metronome-turned-Selfdestruct or what have you. It’s unbalanced, illogical, random. And to me, completely wonderful. One day I’ll dive back into the series but until then, I’m happy to reminisce.